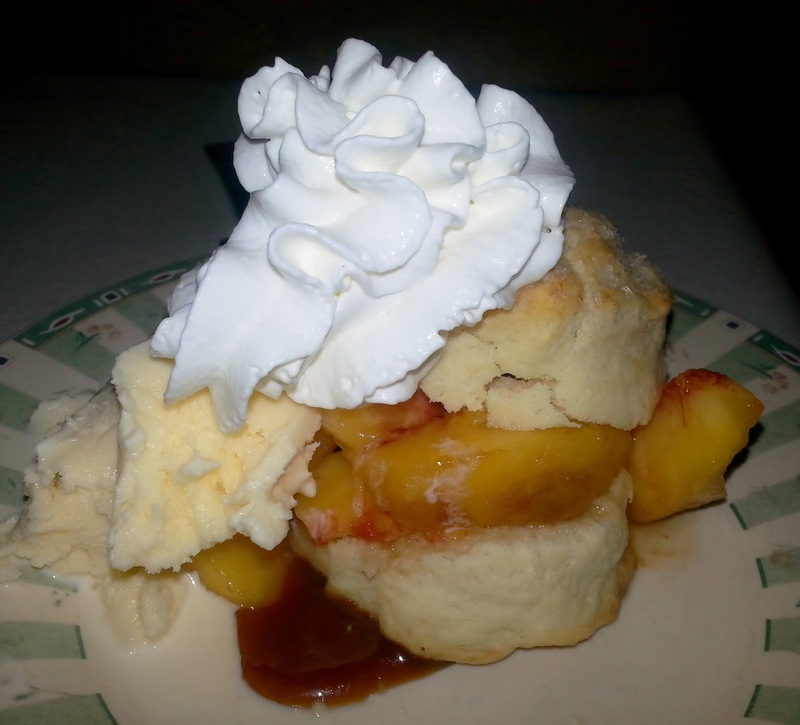 Lee's Orchard, leesorchard, apples: Shortcake! I'm sad to say that this week will most likely be our last picking of peaches for the year. Luckily Josh and I cut and froze about 25 pounds of this lovely fruit last week. All the same, I felt it was only appropriate to share a good transitional recipe that can be used with a variety of fruit. First, I should probably say that I prefer my shortcake not to be overly sweet. I want the fruit to be the star of the dessert and its sweetness to shine. With that, my go-to shortcake recipe is far more subtle and more biscuit-like with a creamy texture rather than a sugar-laden bouncy cake. Before starting your shortcake: skin, trim, hull, slice fruit (about 2 cups sliced) and sprinkle with granulated sugar. Set aside at room temperature while preparing biscuits. Sift together the flour, cornstarch, salt, baking powder and sugar. Stir in enough heavy cream to moisten the dough thoroughly. The goal is to gather the dough, squeeze it, and have it hang together, without dry bits falling off. Turn the dough out onto a lightly floured work surface, and very gently pat it into an 8" circle about 3/4" thick. Using a biscuit cutter, cut out rounds. Dip each into melted butter and place them on a lightly greased baking sheet. I like to sprinkle coarse sugar over them before baking, but that's a personal preference. Bake at 425°F oven for 15 to 18 minutes, till they're golden brown. Brush any remaining melted butter over biscuits immediately after removing them from the oven. Serve with your choice of fruit (Peach Shortcake pictured), ice cream and/or homemade whipped cream! Beat 1 cup of heavy cream with 1 Tablespoon of powdered sugar and 1 teaspoon of vanilla extract until it forms stiff peaks. If available, I split & scrape an entire vanilla bean into mine in lieu of the extract.